Whether you are a manufacturer or responsible for the wholesale and distribution of chemicals, you operate in a complex and highly dynamic sector. You are likely to operate internationally, whether that be in terms of where you source raw materials or where you supply your products to. You will have tightly controlled manufacturing and distribution processes and stringent compliance needs. Having insight and control of your business is therefore of paramount importance; it enables you to deliver on promises and drive profitability. More companies in the Chemical Sector use SAP than any other ERP solution. At Codestone, we have been helping customers in this sector for almost two decades and have built up a unique and valuable understanding of your needs. With SAP Business One we enable you to control every aspect of your business from the procurement of raw materials, through manufacturing and quality control, the alignment of sales demand to production and the timely distribution of products. With SAP you gain the real-time insight you need to operate in a dynamic industry. SAP Business One enables you to manage your customer relationships – to fully understand their preferences and buying patterns. By making this an integral part of your business processes, you are able to accurately predict demand and align this with procurement and production scheduling. By fully managing suppliers and procurement, you are not only able to fully control input costs, but also stock levels. The ability to manage multiple currencies, exchange rates and taxation allows you to understand the real cost of each item and streamline the process from order to cash. SAP Business One enables you to manage and track in real-time every step of your production process. Batch management and quality becomes an integral part of the process and so too the alignment of production with demand to minimise inventory levels while ensuring every customer need is met in a timely manner. By tracking every aspect of your operation within SAP Business One you gain unprecedented insight into your business. You are able to fully understand margins, sales performance and the return on plant and fixed costs. This insight enables you to further improve performance and focus on the most profitable parts of your business. 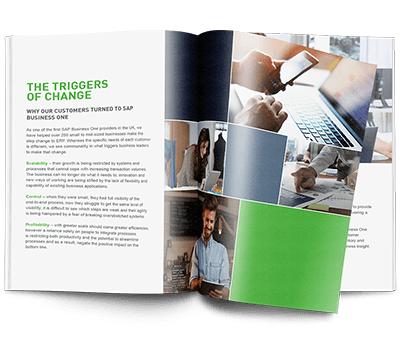 Our eBook on the capabilities of SAP Business One and the value that it can deliver for your business. SAP Business One enables you to improve every area of your business. With SAP you regain control of your business with insight into every aspect of your operation from material sourcing to cash collection. By linking both processes and information, you can streamline production, optimise usage of assets and drive productivity. By maximising every customer relationship, accurately aligning supply and demand and controlling procurement you are able to increase profitability.